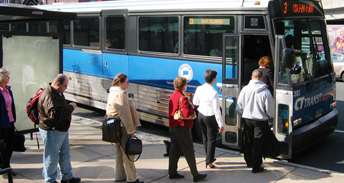 CACT provides newsletters and free training sessions and educational forums periodically throughout the year regarding transportation in Connecticut. Visit our Calendar page to learn about current and upcoming events. Panelist left to right: Jonathan Rubell, Lisa Rivers, Keleigh Arian, Jim Travers, Nancy Krodel at the Mobility Choices in Connecticut: Making a Difference event April 28, 2011.